I've learned in the 28 years of having a parrot that they do like to get in things. I've put all sorts of things on top of his cage. Sometimes to quiet him down, sometimes as toys. No matter what, they tend to be both. Start as an object of fear, then they proceed to be something to be chewed on. In this case, the box once held our Weatheralert radio. In Florida, it's a requirement to have one of those. Not by the various governments, mind you, but if you don't have one, you're going to be at a loss. Since Oscar likes to chew anything cardboard or paper, I put it up there with his tennis ball, and his paper towel insert tube. Originally he looked at it and growled. Then he went over to it and pecked at it. The box leaned back and wobbled. So did Oscar. 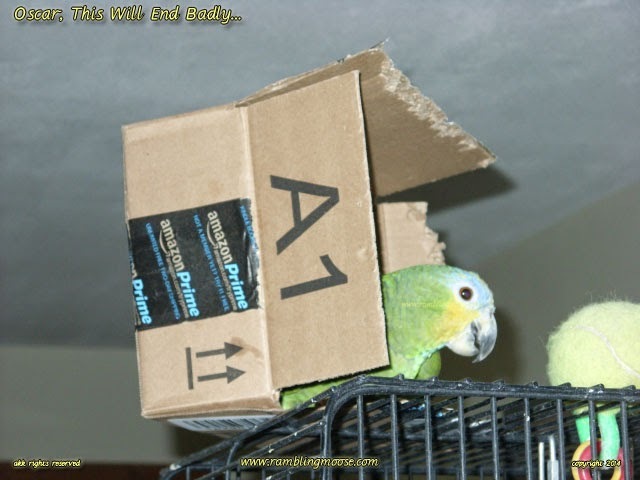 Grabbing hold of the box, he realized I wasn't getting too excited about it, so he may as well do what parrots are known for. He pooped. Then he began to shred the box. I think the wobbling got to be what he wanted because he crawled inside of it instead of playing "Let the Human Fetch" by knocking it on the floor. A happy parrot can be a quiet thing. He went inside his penthouse and began to redecorate it. All the while, he was pushing backward on the box until it got perched precariously on the edge. I said to him "Oscar, this will end badly, why don't you come out?". Expecting a Simpsons result where Santa's Little Helper heard "Blah blah blah sit blah blah blah". I was surprised. He did come out of the box and get interested in other things. At that point, the Looney Tunes result happened. He went to nudge the tennis ball, and the box hit the floor. Oscar was still safe, and I was still entertained. I put that box back on top waiting to see what would happen next. You just never know!